Homework Alabama offers free homework help from subject specialists. Students can also visit Homework Alabama for free tutoring in Math, Science, Social Studies, English. To get to Homework Help through the Huntsville-Madison County Public Library's website, visit http://www.hmcpl.org. Under the 'Research' tab, click on 'Online Resources'. Under 'Resource Collections' select the A-Z search option. From here select H'. On the sceen that appears, scroll down to the 'Homework Alabama' and click on the link. When you get to the 'Online Resources' page, under 'Resource Collections' under the 'Subject' tab, select 'Homework Help'. An alphabetical list of homework resources appears. Scroll down to 'Homework Alabama' and click on the link. Alabama residents only (http://homeworkalabama.org). Click on the link. 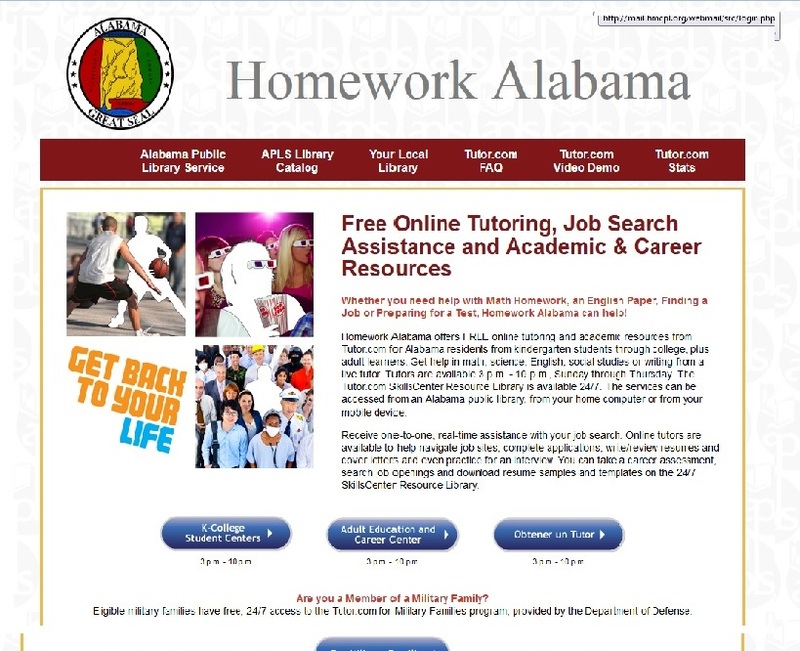 Homework Alabama offers FREE online tutoring and academic resources from Tutor.com for Alabama residents from kindergarten students through college, plus adult learners. Get help in math, science, English, social studies or writing from a live tutor. Tutors are available 3 p.m. - 10 p.m., Sunday through Thursday. The Tutor.com SkillsCenter Resource Library is available 24/7. The services can be accessed from an Alabama public library, from your home computer or from your mobile device. Receive one-to-one, real-time assistance with your job search. Online tutors are available to help navigate job sites, complete applications, write/review resumes and cover letters and even practice for an interview. You can take a career assessment, search job openings and download resume samples and templates on the 24/7 SkillsCenter Resource Library. The K-College Student Centers provide online help at all grade levels with study resources, test prep for standardized tests. Study Resources includes thousands of lessons, worksheets, study guides and videos. Users can search based on Topic (English, Math, Science, Social Studies and Other), Subject (education levels Elementary, Middle Grades, High School, College Level, plus Writing) and Subtopic within each of the Topic and Subject categories. Many of the subtopics include links to additional websites. The Adult Education and Career Center provides career center aids in writing cover letters and resumes, citizenship, GED assistance, financial literacy, etc. Test Prep Resources helps users prepare for the SAT, ACT, standardized tests in all 50 states, graduate school entrance stests, civil service, GED and more. As with Study Resources, the search capabilities are broken down by Topic (Standardized Test Preparation, State Standardized Tests), Subject (College Entrance Exams, Graduate Entrance Exams or State for State Standardized Tests) and Subtopic (subcategories within each Subject area. Career Resources includes local open jobs, resume and cover letter templates, interview guidelines and more for job seekers. Subjects include Citizenship, Computer Literacy, Financial Literacy, Job Openings, Job Resources, Resumes and Cover Letters, etc.). Many of the subtopics within each category include links to websites. Tutor.com for U.S. Military Families is a DoD-funded program that allows eligible students in U.S. military families to connect to a live tutor online at any time for one-to-one help with homework, studying, test prep, proofreading and more. The service is available at no charge to K-12 students and some adults in active duty Army, Navy, Air Force and Marine Corps families.Tutor.com for U.S. Military Families is a DoD-funded program that allows eligible students in U.S. military families to connect to a live tutor online at any time for one-to-one help with homework, studying, test prep, proofreading and more. The service is available at no charge to K-12 students and some adults in active duty Army, Navy, Air Force and Marine Corps families. You just select your family’s branch of service to determine your eligibility and to create an account. 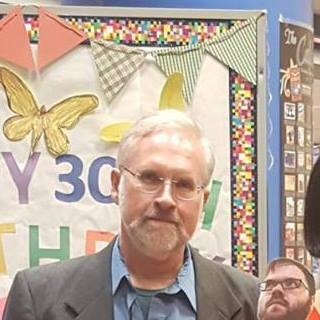 In this video, a staff librarian from the Athens-Limestone Public Library explains how one of her patrons used Homework Help Alabama to get through a tough college class.